What Is Protein and what are good sources of protein? The simple answer to the question what is protein, is that protein makes up the building blocks of our body and is needed for growth and repair. It is fair to say that protein is pretty important stuff! 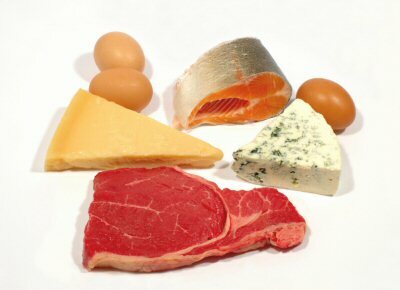 Foods that are high in protein such as meat and cheese are often also high in fat and in calories, which is not necessarily favourable to us. What is our typical daily protein requirement? An average man will need about 55g (2oz) of protein per day, an average woman will need about 45g (1.5 oz) and a child (about 8 years old) requires 28g (1 oz) of protein in one day. The average person in the western world eats about 100g (3.5 oz) per day, which is far more than they need. Those of us that need extra protein in our diets are those recovering from serious illness, injury or lactating women. What is protein and can I eat too much? Yes, and it can be harmful if excessive. Our body is not able to store excess protein and so it has to be excreted, but before it can be excreted the excess has to be converted into glucose or urea. This in turn places huge pressures on the liver and kidneys. Eating too much protein also leads to acidic urine, which can result in calcium loss potentially resulting in osteoporosis. Protein is not a good energy source because the process of breaking it down for use as energy is not a very efficient one. Our bodies will only use protein as energy in times of starvation and under exceptional circumstances. The amount of different parts of our body formed from various types of tissue, that need building, growing and repairing all require protein for their process. That though is where the simplicity ends. We can take the question what is protein a little further. Proteins are made up from combinations of about 22 different amino acids. We say about 22 because the world of science seems to come up with a new amino acid every few years! So, never mind what is protein. What are amino acids and how do amino acids function? Amino acids combine together in different formations to form various functioning proteins. 8 of the 22 are termed Essential Amino Acids (EAAs) because they cannot be synthesised by our body and therefore must be obtained from our diet. Any animal based protein (meat, fish and dairy) will contain all eight of these EAAs and for this reason they are given the term High Value Proteins. Most plant-based proteins contain only some of the eight EAAs and for this reason they are termed Low Value Proteins. As a result, strict vegetarians or vegans must eat a whole range of vegetables to make sure they are getting all eight EAAs in their diet. A combination of rice and lentils or nuts and rice also provides all EAAs. About one third of protein in the average diet comes from plant sources and two thirds from animal. Dried peas and beans contain about the same amount of protein as meat, fish and cheese. Although when they are soaked in water this is slightly reduced. In conclusion, what is protein ? Very very important indeed! Click back from what is protein to more healthy foods to eat.